It's a cloudy but breezy Saturday morning at Bintulu whereby the sun has decided not to shine too brightly and the rain has decided not to pour. Good! Anyway, I don't feel like elaborating about "spring-cleaning" at the cemetery and I purposely didn't take any photo. People say, it's disrespectful to the deceased if pictures of their tombs were taken. Although I'm not superstitious, whenever my conscience decides against doing something, I won't do it. Looks familiar? 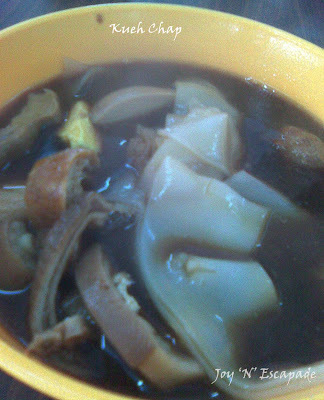 This is Sarawak Kueh Chap. Let's do a comparison of this with the one sold at Kelana Jaya. 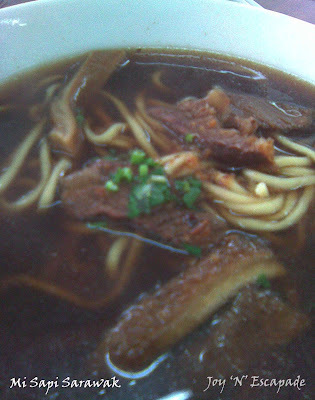 This is Mi Sapi, or Beef Noodles. It's basically a dish of beef slices with noodles in beef broth, garnished with chopped coriander. Hmmm... don't compare this to Taiwanese braised beef noodles because they are two different dishes. Gosh it looks so delicious.